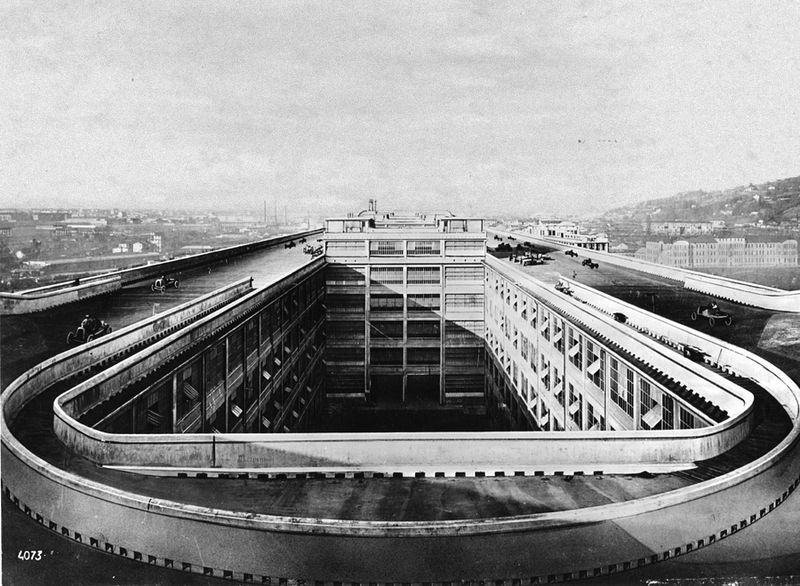 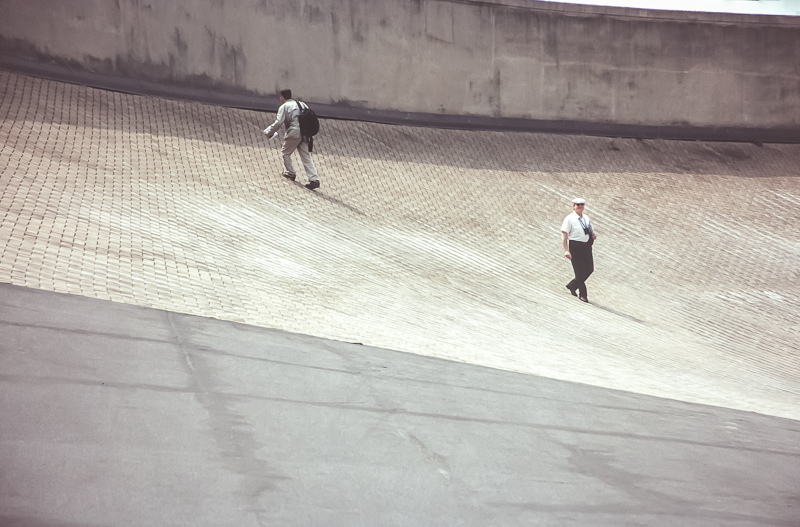 The Lingotto building in Turin, Italy, is a massive half-kilometer long reinforced concrete structure, five stories tall, that once housed the largest and most modern car manufacturing plant in Europe. 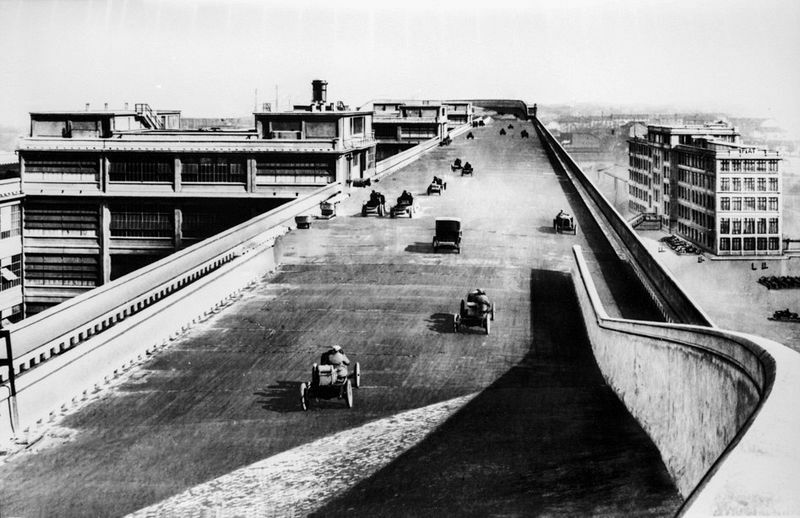 Located in the heart of the city, its original owners —Fiat—made clever use of the available real estate by building a high-speed test track on the building’s unusual banked rooftop, where thousands of Fiats underwent testing once they came out at the end of the assembly line. 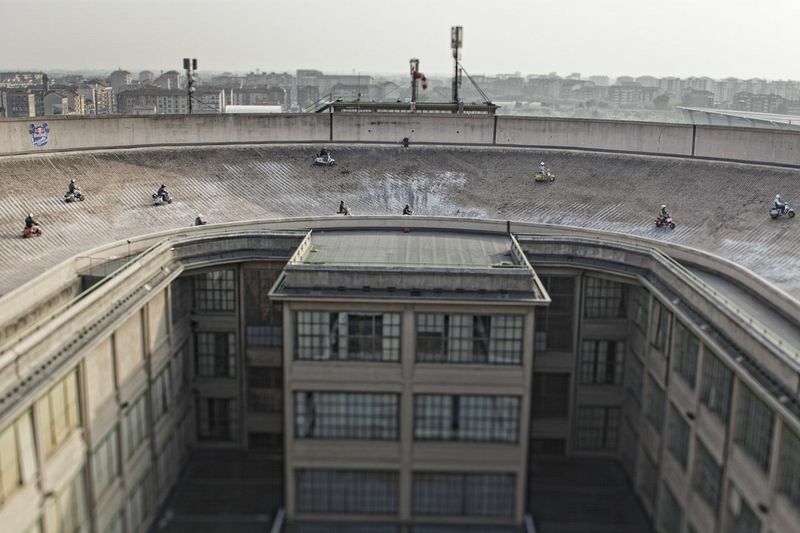 Built between 1916 and 1923, the building was the brainchild of Italian engineer Giacomo Mattè-Trucco, and was one of the first buildings of its size to rely heavily on reinforced concrete. 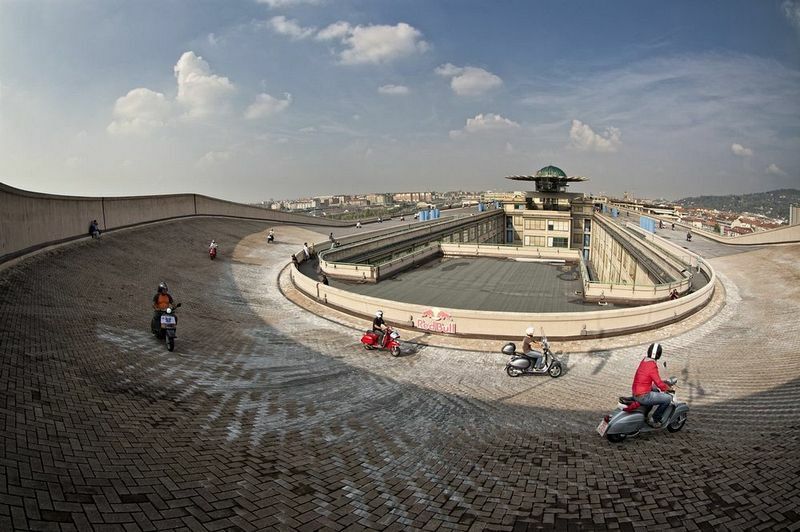 Space constraints imposed by the railway lines nearby and the shape of the terrain, forced Giacomo Mattè-Trucco to develop a building that went vertically up and ended in a simple yet ingenious looped rooftop test track with two banked turns. 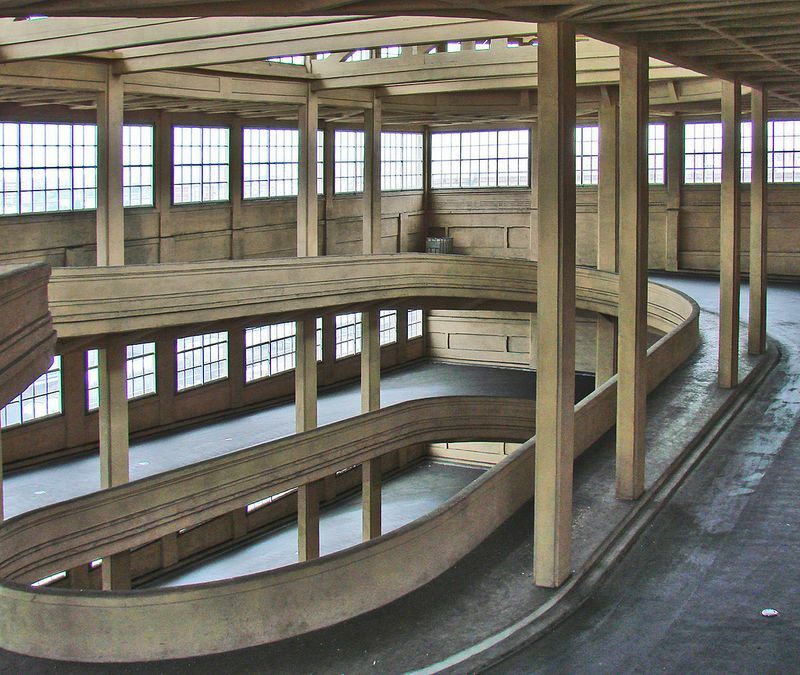 The track is reached by spiral ramps at either end of the building that thread their way up through floor after floor. 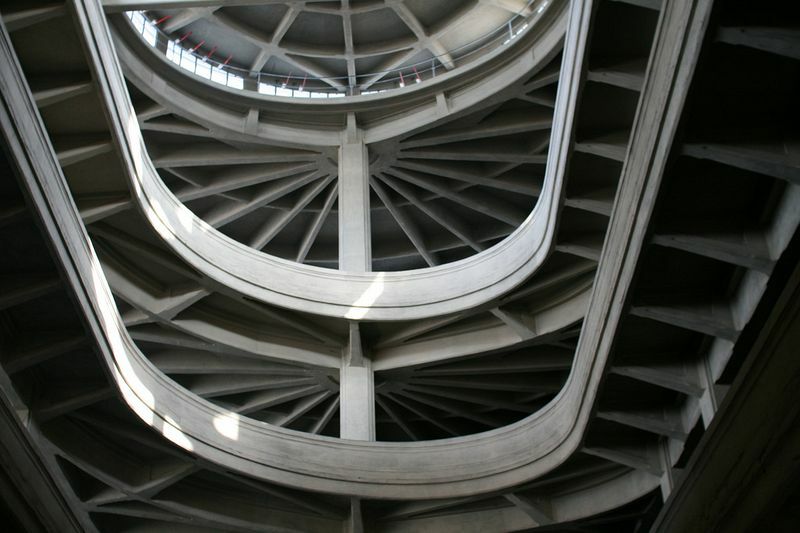 These ramps are braced by reinforced concrete ribs that radiate from the columns around the central well like the ribs on the underside of water-lily leaves. 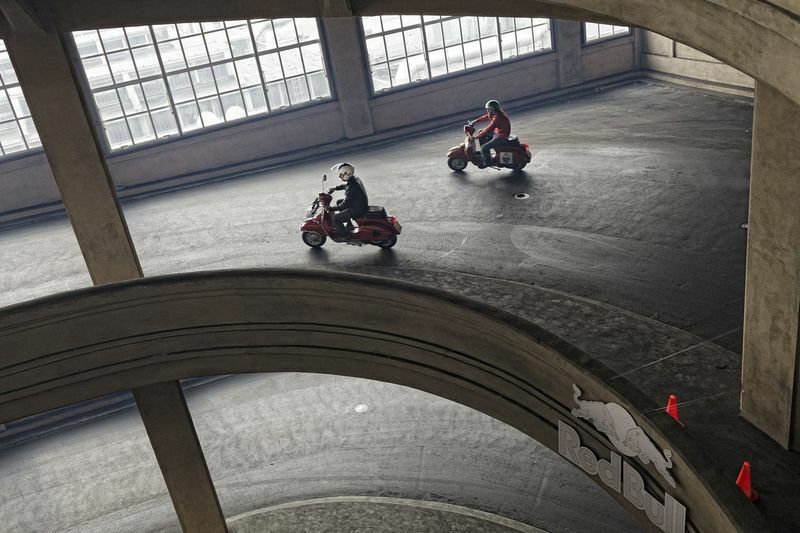 The manufacturing plant’s assembly line itself was unusual, and the test track was an integral part of it. 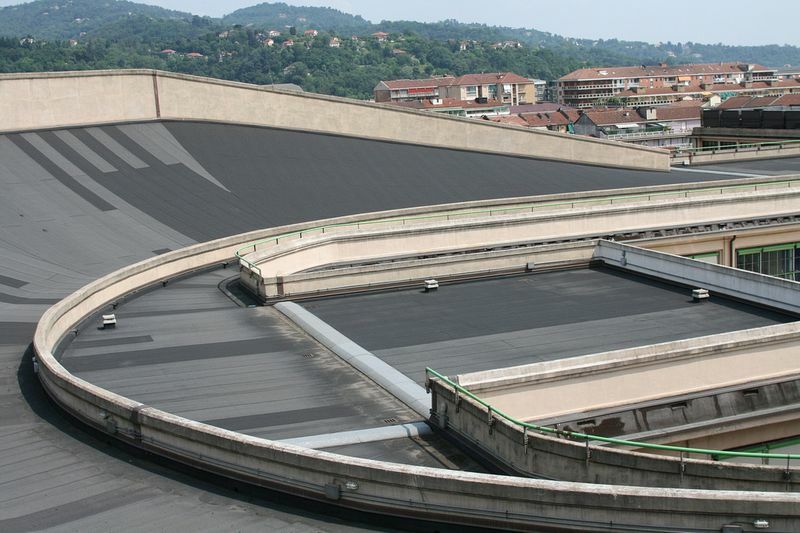 Production started at the ground floor and continued sequentially up through the upper floors. 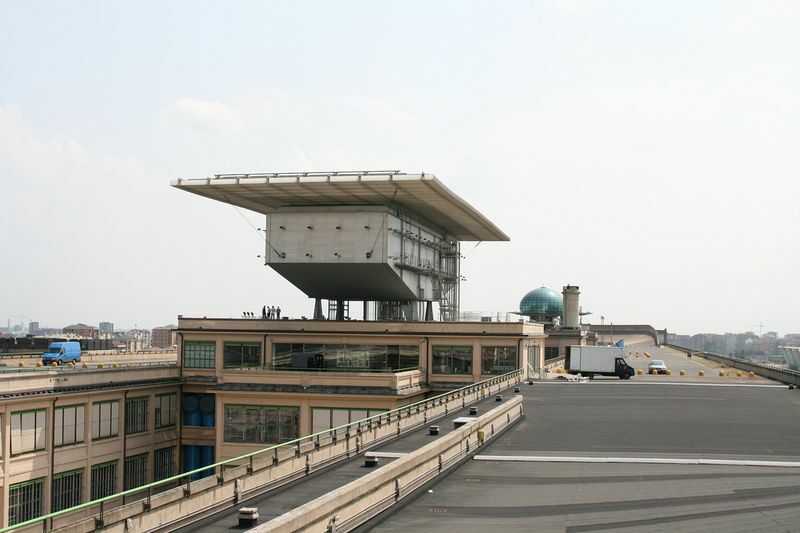 As each floor passed, the cars approached their final shape until they emerged as a finished product at the rooftop where they were ready for testing. 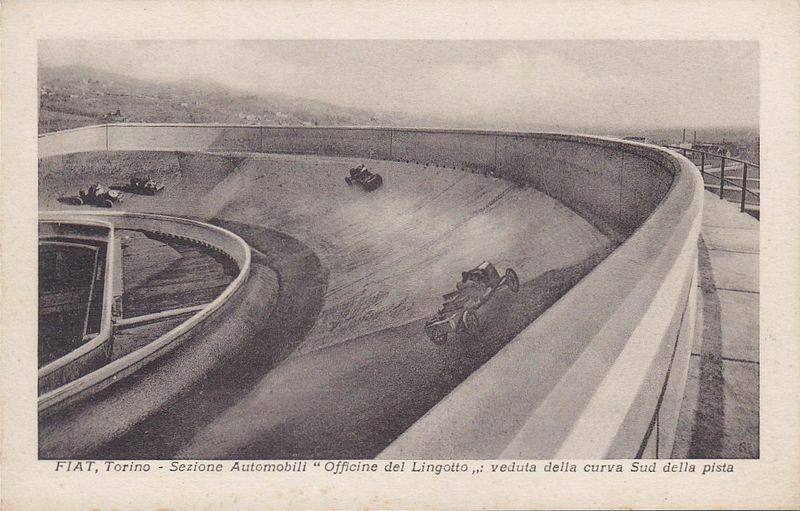 While the banked sections are impossibly tight making high-speed testing unfeasible, rumors persist that concepts and racing engines were also tested here, including the one-off 1954 Turbina, with its projected 160mph top speed. 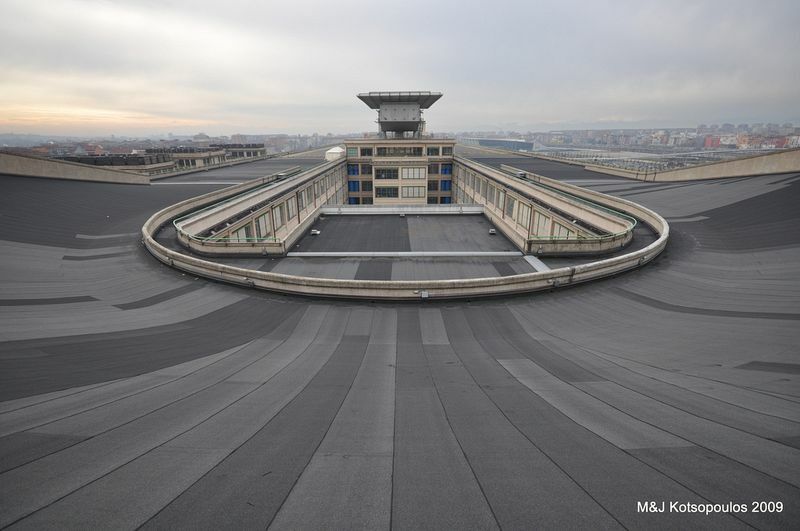 The Lingotto Factory produced 80 different models of car putting out an average of 200 daily from it's opening until the 1970s, when it was eclipsed by the modern Mirafiori plant. 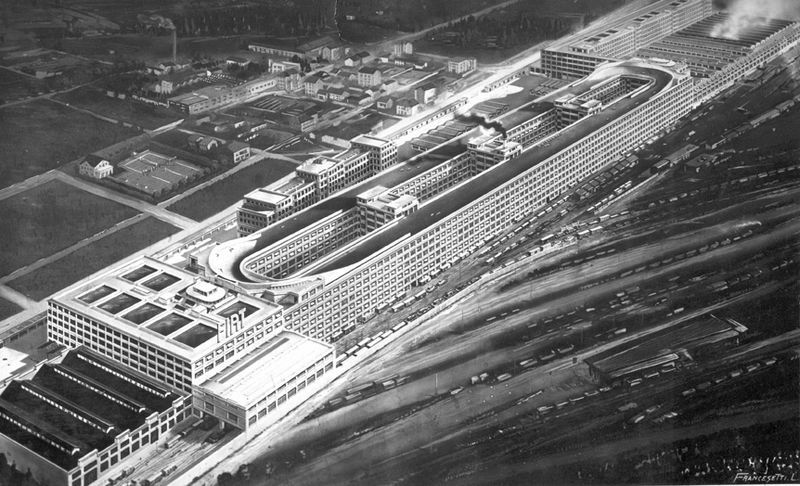 The last Lancia Delta rolled out of the factory in 1979. 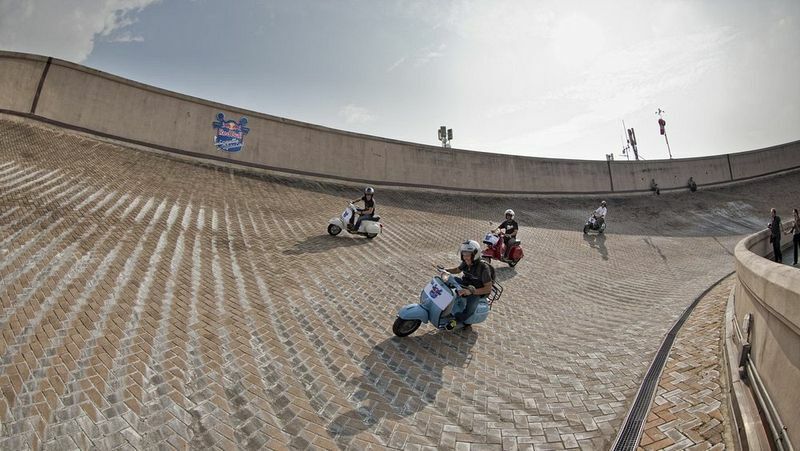 Three years later, the factory was officially closed. 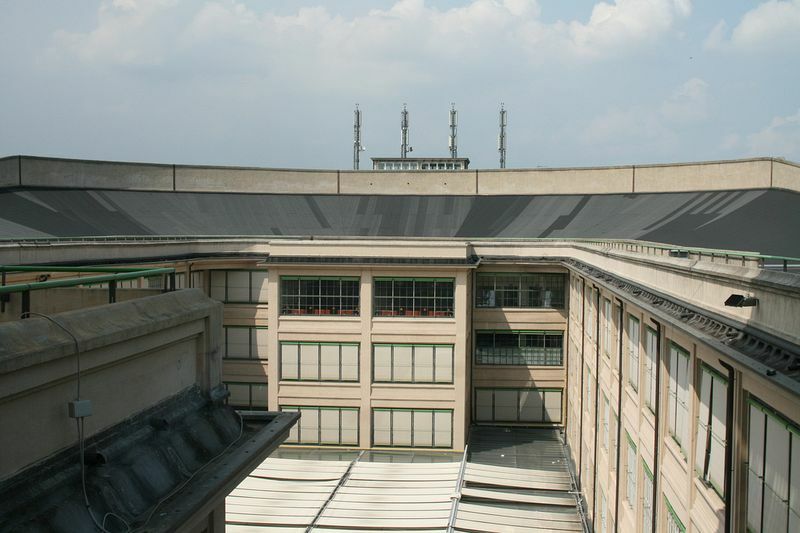 The Lingotto building was eventually converted into a modern complex with concert halls, theatre, a convention center, shopping arcades and a hotel. 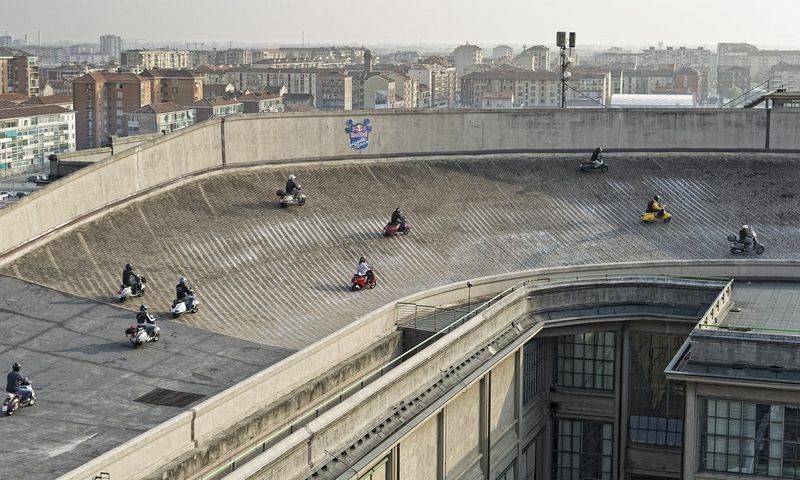 The rooftop track was retained and can still be visited today on the top floor.